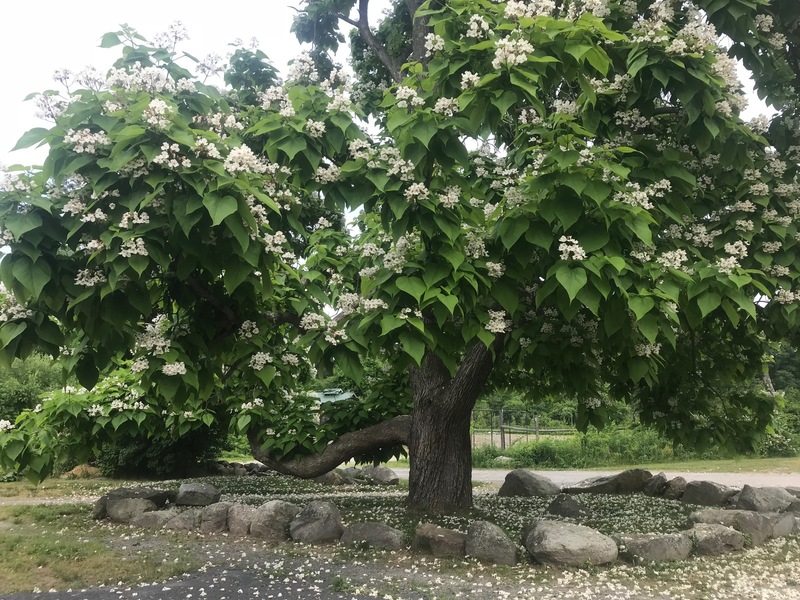 The most prominent tree at Thoreau Farm, Birth House of Henry David Thoreau, is a tall and splendid Northern Catalpa, located beside our parking lot. It lends grandeur and scale to not just the 1878 Kitchen Garden, but to the entire property. The Northern Catalpa is a fast-growing native tree with rot-resistant wood. She is one of the first features visitors see, and often they pause with her before moving on to the house. Its trunk and branches can tend to twist and bend. Ours has a large branch a few feet above and parallel to the ground, that bends and swoops like an elephant’s trunk, tempting visitors to touch and pat her as they walk by. Before the birth house opened to the public for the first time in 2010, we oh-so-wise board members agreed: that Catalpa tree should be cut down. However, for reasons none of us can actually recall, it was left standing. Looking at her, I am awash with relief, though no one now can remember what we were thinking when we all voted to have her removed. Because I created, manage, and tend our Kitchen Garden, I spend scores of hours annually near this tree. Bit-by-bit, she’s slowly “tamed” me, and I’ve come to adore her in every season. She’s a sweet friend who smiles over the garden. I have come to need her in my view. But I have a confession to make: I used to heartily dislike Catalpa trees. I can’t quite say why. Their long, dried “string bean” seed pods make a mess. I found the enormous leaves too big to please my personal esthetic. And those flowers: I found them from a distance to be quite tacky. But I’d never seen the blooms up close before, which totally revolutionized my view of Catalpa, and began my seeing our tree in a new light. She’s very amenable to a face-to-flower close-up for anyone taller than four feet, taming with her sultry and copious blooms in snowy white with orange and purple markings on their throats. They grow in lovely clusters, which decorate the tree in beautiful profusion in June. They have a light scent that for me is almost touches a memory I can’t quite grasp before the smell dissipates. I still am not a fan of those seed pods, which can be up to 20 inches long! They fall in equal profusion in the fall. Between flower and pod fall, the leaves shed in the fall, too, after turning a stunning yellow. Any tree that requires three clean-ups a year (one each for flower, leaves, and pods) is what I consider “high maintenance.” But it turns out, I think she’s worth it. And when the time to leave was near: “Ah!” the fox said. “I shall weep.” “It’s your own fault,” the little prince said. “I never wanted to do you any harm, but you insisted that I tame you…” The Fox and the Little Prince. The Catalpa is not a long-lived tree, some living only 50 years, though they can live much longer in the best conditions. We had wondered how old ours was, and working in the garden one day a few years ago, two visitors provided clarity. They were a pair of the Breen sisters, part of the last generation of children who grew up in the house, daughters of the farm’s last private owner. They revealed that the tree was planted to mark the birth of their youngest sister. It’s in that way we learned the tree’s age, now around 65 years. 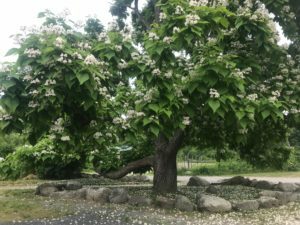 Given that the Northern Catalpa typically grows to a height of 40–60′ with a spread of 20–40′ at maturity (according to the Arbor Day Foundation), we can see that our tree has likely reached her full glory. This past fall, a storm brought down a massive branch, really an entire section of the tree. We discovered that our Catalpa is not fully well. In fact, her main trunk has become hollow, which can just barely be seen by looking up at the gaping hole that’s opened in her torso, located over six feet above ground. This tree’s time is perhaps not immediately neigh, but her end moves into sight. When I think of her no longer gracing that spot, I am touched by grief. Despite her failing strength, she bloomed magnificently this year with her usual timing. I ponder that if I had never had the chance to fall in love with her, I wouldn’t have become so sad at her anticipated departure. But our relationship was entirely worthwhile; now no other Catalpa is “our” Catalpa, as the time I’ve spent with her has made her special to me. I muse about the possibility of replacing her with another special tree, something native – perhaps a blight-resistant American Elm or Chestnut? But that would be a tree I haven’t met yet – one that is not yet special to me. Deborah Bier is a rabid gardener and a board member of Thoreau Farm Trust. She is a best-selling author and a dementia behavior specialist. What Would Henry Think, Say and Do in 2018? This month, as we transition into 2018, the various social and political challenges addressed in the book What Would Henry Do? published by Thoreau Farm Trust last year in time for Henry’s 200th birthday, loom today no less significant. This unique collection of 41 essays — by many of this century’s great Thoreauvian thinkers — ponders critical issues by speculating how Henry might respond to them. After a stressful year of disruption on the national and international scene, the essays in our book might be more essential for us all to contemplate now than at any time in each of our lives. Thoreau Farm Trust President Ken Lizotte in the Writer’s Retreat at Thoreau Farm. As I explained in my introduction to the book, back in Henry’s time “societies in every corner of the earth had long been dominated by agriculture, ensuring a life where most everyone remained in one place from birth to death, living on and working off the land just outside one’s door. You interacted with the same friends and neighbors day in and day out, you thought the same thoughts, adhered to the same credos, held similar assumptions. Today, at the dawn of a fresh year, we’re faced with the same sort of questions. How we answer them will either solve or exacerbate the many problems of our times. So on behalf of the Thoreau Farm Board of Trustees, I invite you to join us as we facilitate a dialogue throughout the coming year via panels and discussion programs, or by engaging with our blog, or during a quiet visit to Henry’s house and/or Walden Pond, or simply carrying the ideals and messages of Henry with you as move about the many corners of the earth. Who can be found between pages of our book? For starters there’s: Wicked author Gregory Maguire; Laura Dassow Walls, (author of the current best-selling Thoreau biography, Henry David Thoreau: A Life); Larry Buell, author, (most recently, The Dream of the Great American Novel) and expert on Transcendentalism, Emerson and Thoreau; Robert D. Richardson, author of acclaimed biographies of both Henry and Ralph Waldo Emerson; Frank Serpico (yes, that Frank Serpico, former New York City police detective); actor-activist Ed Begley Jr.; and a former U.S. president who goes by the name of Jimmy! And many more. Available at Amazon, Barnes & Noble, the Shop at Walden Pond, the Concord Bookshop and independent bookstores throughout the US and Canada. Ken Lizotte is President of the Board of Trustees at Thoreau Farm and lives in Concord, Massachusetts, with his family. Comments Off on What Would Henry Think, Say and Do in 2018? Tagged as What Would Henry Do? A visitor to Thoreau Farm once left that note on the message board in the birthplace foyer. Those words came to mind as I read Laura Dassow Walls’s terrific new biography, Henry David Thoreau: A Life (University of Chicago Press). You will know what I mean when you take this book in hand, as I hope you will, for Walls has at last unveiled the Thoreau we celebrate at his birthplace. Hoping to put to rest the simplistic, one-dimensional caricatures of Thoreau that proliferate to this day (you will recall Kathryn Schulz’s outrageous hatchet job in the Oct. 19, 2015 New Yorker, entitled “Pond Scum.”), Walls offers readers a meticulously researched, elegantly written story of the complex, multi-layered man he was in life. The Thoreau that emerges from Walls’s pages is indeed well rounded. 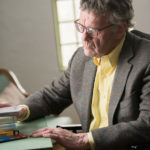 As those who have read him in depth know, he was a busily engaged man who was known and loved by a great many of his contemporaries, including Ralph Waldo Emerson’s son Edward, Nathaniel Hawthorne’s son Julian, and the young Louisa May Alcott. Though Concordians felt free to tease and judge him—he was after all, one of their own—they relied on him to build their sheds and fences, cut the village Christmas tree, offer up keen insights from the dais of the Concord Lyceum, entertain their children on nature walks, and expertly survey and record much of Concord’s landscape. 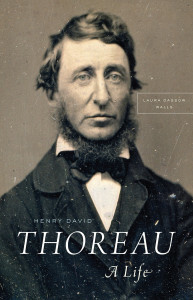 For his part, Thoreau—who traveled more widely than is generally known—never wavered from his devotion to his hometown and took precious time and energy from his own writing to help earn money for his family, tend to the needs of his friends, and work behind the scenes with neighbors to help transport escaped slaves to freedom. The creative genius and gifted naturalist we find in these pages is certainly familiar. 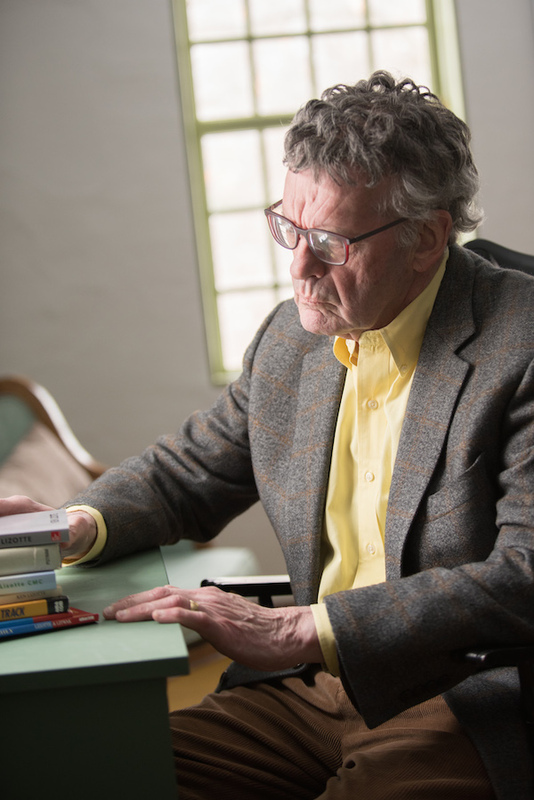 But Walls succeeds in redressing the mischaracterizations that have long kept Thoreau out of reach for those who have seen him as too far removed from their own experience. Walls tells the story of a much less chilly Thoreau and so brings him closer to us. In struggling to overcome harsh criticism, bitter loss, and debilitating illness, Thoreau drew strength from love and joy and from the many human relationships that sustained him. The rough edges are still there, but Walls helps us understand why, providing a welcome corrective to common wisdom. Walls writes in her Preface, “Thoreau earned the devotion of friends who saw in him no saint, but something perhaps more rare: a humane being living a whole human life.” That is the Thoreau Walls sought and found, and readers everywhere will likely welcome him warmly. Lucille Stott is a charter board member emerita and former president of Thoreau Farm Trust.